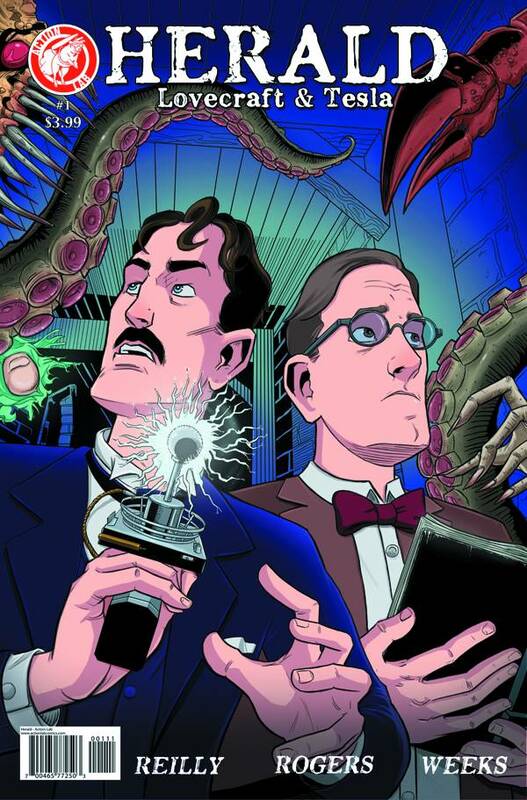 Back in 2012 the popular site io9 had a post with a very appealing picture that was their call to arms to create a Lovecraft/Tesla team-up comic for all of us to love. It looked sort of like this: The image sparked all sorts of wants and protests for someone to establish a decent storyline where these two obscure characters in our history could investigate and dispatch the paranormal/occult. And thank the gods those wants and protests were heard and have been answered with John Reilly’s Herald: Lovecraft & Tesla. This alternate history series there are a lot of things that didn’t jibe with me. That is until I came to terms that this comic series is an extreme alternate history twist from what I am used to. This was particularly difficult due to the fact that I consider myself a very (very very very) amateur Lovecraftian scholar, so when the years/time didn’t match up, and he was living with his mother still threw me off. However the sheer cleverness of this opening issue has compelled me to become a fan. In this world Tesla is engaged to the very brave and prideful Amelia Earhart. When the future Mrs. Tesla takes off on her famous flight, Nikola becomes fearful of the equipment his darling is using make history. After seeking advice from his close friend, Einstein, Tesla heads to the home of famous alternate dimension aficionado, H.P. Lovecraft. From what I understand the second issue is to be released digitally on Comixology today, November 5th, so while your there checking out the first issue, be sure to just add that one to your cart to. You will not be disappointed. For all updates on this project and new issues check the status on their Facebook Page, or on their Twitter account @heraldcomic. Print editions should be out sometime, maybe next year, I am not entirely sure on that. 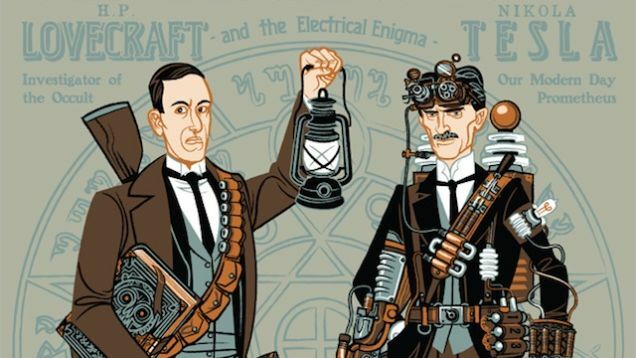 But until then please indulge your minds in the Herald: Lovecraft & Tesla. BUY IT NOW! If you have checked out Herald: Lovecraft & Tesla , let me know what you think by leaving a comment. And if you like all the tasty bits we gibber about here, become a follower or submit to receive email updates with every new post! Check us out on Twitter @UnspkbleGibberr and on Facebook at http://www.facebook.com/UnspeakableGibberer. Providenc Rhode Island, 1928. A dangerous inmate disappears from a privat hospital for the insane, his method of escape baffling the authorities. Only the patient’s final visitor, family phusician D. Marinus Bicknell Willet – himself a piece of the puzzle – holds the key to unlocking The Case of Charles Dexter Ward. A macabre mixture of historical investigation grave-robbing and bone-chilling revelation, this adaptaion artfully lays bare on of H.P. Lovecraft’s most horrifying creations. That is an excerpt from my review of The Case of Charles Dexter Ward , for Haunt of Horrors Press. Culbard is at it again, with his beautifully illustrated vision of one of the late Lovecraft’s best works. Any fan of Lovecraftian literature is in need of having this adaptation on their shelves, next to the rest of their moldering tomes. Happy reading! Check out the whole review HERE! If you have checked out The Case of Charles Dexter Ward , let me know what you think by leaving a comment. And if you like all the tasty bits we gibber about here, become a follower or submit to receive email updates with every new post! Check us out on Twitter @UnspkbleGibberr and on Facebook at http://www.facebook.com/UnspeakableGibberer. WHAT MAKES YOU HUMAN? YOUR BODY? YOUR MIND? YOUR RELATIONSHIPS? IMAGINE A UNIVERSE WHERE ALL OF THESE ARE PROGRAMMABLE. THE LIMITS OF YOUR CURRENT BODY NO LONGER APPLY. YOU ARE DIGITAL AND IMMORTAL. James Watson is suffering from a delusional disorder known as capgras, or so he’s been told. Nothing seems to feel entirely real since the accident. His wife, his kids, his friends, all feel disconnected from what he once remembers, like no one is who they seem. Feeling misunderstood, James finds help with a local psychiatrist who specializes in capgras delusions. Hoping to find his place again in the ‘real’ world, he agrees to meet with other sufferers to talk, and learn from one another. However not all of the capgras sufferers believe what they’ve been told. After hearing them out James encounters a strange man with a strange purpose. Suddenly a door has been opened to James possibly revealing the answers he is looking for. Will he be able to cope with the truth? Or more importantly, will he be able to live in a Transreality? Chris Lackey has come out of the gate in full force in this, his first solely written and illustrated graphic novel. Captivating illustrations, varnished with vibrant colors and detailed cel-shading, bring each panel together along with dynamic writing to tie together both the emotion and expression of each fantastic character. Though the story is, at times, derivative of other plot lines like The Matrix , Inception , or even Total Recall , there was one part of the book that made me think of Bill & Ted’s Excellent Adventure . When Septimus arrives, initially saving James, I immediately thought Lackey had used George Carlin as a model for the character and creating his own ‘excellent’ Rufus – Morpheus cross over. It was little remembrances like this that amused me and kept me going. But something more interesting were the themes Lackey induces unto the reader. I am a complete stranger when it comes to the concept of trans-humanism, which is the belief or theory that humans will evolve beyond its current physical and mental limitations by means of technology. I have heard small talk about the singularity and mind-melds with computers, and frankly it kind of freaks me out. Though immortality and information at the request of a thought sound pretty cool, to me, there seems to be nothing human about being downloaded and coded into a digital world. I think that is one of the themes of this story. How does one maintain a sense of humanity in a world were humans aren’t the only ones in charge. There are many levels to Transreality ‘branching’ off too; what defines humanity? How does one maintain that sense while being practically detached from a physical body? Who’s behind RainBird Industries? Who is behind the control panel, so to speak, that keeps all the simulations and digital consciences in check? All are great things to think about and to hope Lackey someday expands on in either a series of comics, or more Transreality world based graphic novels. This is a story that anyone can enjoy whether or not science fiction is your genre of choice. I myself am more attracted to horror/fantasies but this has switched on a new found interest in trans-humanism Sci-Fi. I was able to read it in one sitting, which isn’t always easy due to time or general interest in the story, and was able to follow the storyline easily. Stay up to date at the official Transreality site to find out when and where you will be able to pick up your copy. As of right now, publication in the U.S. is due out in March. Keep your scanners on and ready to locate and digest this fabulous work. Self Made Hero has done it again. like its predecessor, The Lovecraft Anthology: Volume 1, Dan Lockwood has ushered into this realm a beautifully illustrated hoard of horror. I am of coarse talking about The Lovecraft Anthology: Volume 2, incase you didn’t realize already. Looking back on my review for The Lovecraft Anthology: Volume 1, I have reflected on some of my comments. To this day, I still visit the pages of volume 1, and have to disagree with some of those late comments. Though I still believe the illustrated panels are what make up an efficient comic/graphic novel, it is the words we rely on when our eyes get ahead of us and we need to read whats happening to interpret the image. After all, we’re readers not viewers of these works. That said, most of these works are illustrated so brilliantly that my eyes hardly touched a word. I am very familiar with Lovecraft’s work, and know a few of his tales like old songs. So for a lot of these addaptations I was fortunate enough to know what was happening and only needed the images to carry me through. In the tradition of how I formatted the review for Volume 1, I have listed each adaptation and have a small something to say about each. Pickman’s Model, adapted by Jamie Delano, illustrated by Steve Pugh, Staging by Jon Haward: Right out the gate Dan Lockwood enlists one of his best choices for this collection. Delano, Pugh, and Haward have worked magic into bringing this piece to life. Every panel, every phrase took me down into the cellar with Thurber and Pickman and had me filling in the blanks as to what damnable creations Pickman was responsible for. Great stuff! The Temple, adapted by Chris Lackey, illustrated by Adrian Salmon: Everything about this entry is spot on. The hard shapes, thick lines, and heavy shading are appropriately placed for the era this story is set in. You can tell Lackey has a fondness for the tale and does what he can to capture the images meanings. From Beyond, adapted by David Camus, illustrated by Nicolas Fructus: Another grandslam for this graphic collection. Great accompaniment by Camus, but anyone can tell, Nicolas Fructus gets what this story is about. Amazing fuscia/violet panels that has set my pineal gland a fire! He, adapted by Dwight L. MacPherson, illustrated by Paul Peart Smith: I really dislike Lovecraft’s original story, however I believe MacPherson and Smith have done and excellent job with a crappy tale. The illustrations weren’t my favorite but I did enjoy the protagonist looking just like H.P.L. The Hound, adapted by Chad Fifer, illustrated by Bryan Baugh: I feel this adaptation took on a bit of the Harley Warren/Randolph Carter archetype, St John being the dominant male figure. Baugh’s sepia skinned panels stand out from the other adaptations in this book, while Fifer adds a comedic style to the dread he portrays. The Picture in the House, adapted by Benjamin Dickson, illustrated by Mick McMahon: To me the story is best told as a literary tale, maybe even a short film. Unfortunately the backwater dialogue is pretty hard to follow panel to panel, and McMahon’s illustrations did not captivate my attention. The Festival, adapted by Simon Spurrier, illustrated by Matt Timson: This is my favorite adaptation in this collection. Changing up the format a little to more of a picture book quality, Spurrier and Timson have portrayed a horrifying experience that leaves the reader still wanting to visit Kingsport again and again. I only wish this was the closer in the collection. The Statement of Randolph Carter, adapted by Dan Lockwood, illustrated by Warwick Johnson Cadwell: I don’t have much to say about this adaptation. Closing out the collection and with one of H.P. Lovecraft’s best known short works, I thought this would have been done better. Didn’t care for the illustrations, and the writing did little to keep me interested. All in all, I would recommend this volume over the first. Both are a must if you are an H.P. Lovecraft fan, and just necessary to have to stimulate ones imagination. Again, Dan Lockwood has done an amazing job gathering these brilliant artists and writers to collaborate in creating such great work. This is what feeds the Lovcraftian community and what grows the population of new readers of the late mans legacy. As I said while closing my review for volume 1, I really hope that these volumes continue to be made. I know there are only so many short stories that one can adapt (We’ll leave the larger adaptaions to I.N.J. Culbard!) but maybe new artist can give their take on a tale and give us some new perspective. This review took me a pathetic one year to complete, and in a way I am happy it did. I read it in a white heat, immediately following The Lovecraft Anthology: Volume 1, and didn’t have the best opinions of the work. After a year of continuous viewing of volume 2 I have come to the conclusions you have already read. My thoughts on volume 1 have changed as well, however I must leave my initial thoughts on the piece as they are. Either way I hope you enjoy both volumes as I have and continue to do. Cheers. 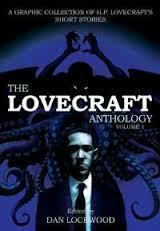 If you have checked out The Lovecraft Anthology: Volume 2 , let me know what you think by leaving a comment. And if you like all the tasty bits we gibber about here, become a follower or submit to receive email updates with every new post! Check us out on Twitter @UnspkbleGibberr and on Facebook at http://www.facebook.com/UnspeakableGibberer. When it comes to Lovecraftian based graphic novels/anthologies, though the writing takes a big role, it seems the whole package rises or sinks with the art. Lovecraft’s work was visceral. It created disturbing images that we had trouble correlating and left our minds troubled with confusion. Through his words he tried to show us other dimensions, and described creatures and forces outside any human comprehension. So, how does one exactly draw blasphemous fish-frogs of nameless design, or ink a color out of space? The Lovecraft Anthology: Volume 1 is courageously edited by Dan Lockwood, and is penned and inked by some of arts greatest devotees to Lovecraft’s mythos. This volume contains seven adaptations by different writers and artists and is a great collection. The Call of Cthulhu, written by Ian Edginton, Illustrated by D’Israeli: A great story to open this anthology, though I felt that it missed some of Lovecraft’s best moments. D’Israeli’s style isn’t my favorite, but his depiction of Cthulhu and the M.C. Escher-like R’lyeh were the best panels of this adaptation. The Dunwich Horror, written by Rob Davis, illustrated by I.N.J. Culbard: I wasn’t much of a fan of I.N.J Culbard’s adaptation of At the Mountains of Madness, and I feel that his art is generally not very Lovecraftian. That being said, I was surprised at his attempt with this story. Along with great writing, Culbard’s vision left me wanting more. 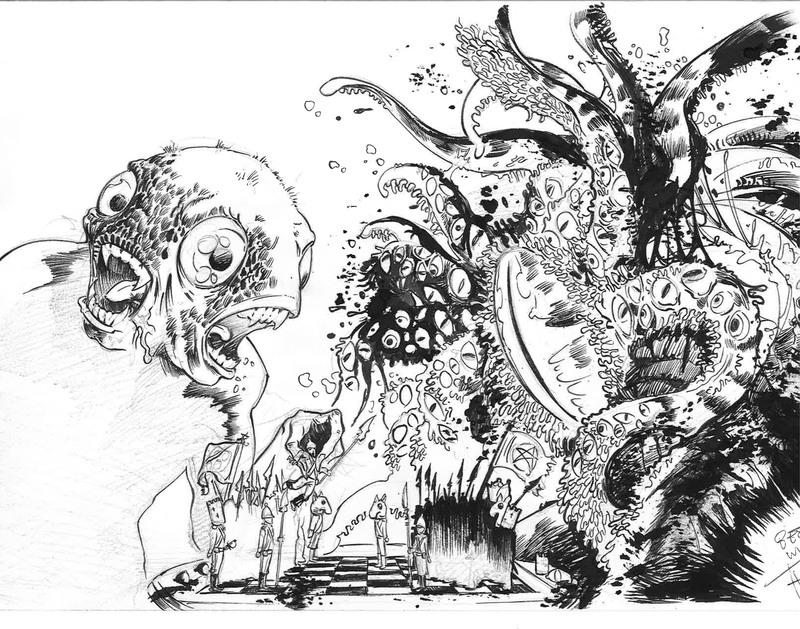 The Colour Out of Space, written by David Hine, illustrated by Mark Stafford: This is one of Lovecraft’s greatest unnerving and unexplainable tales, making it one of the most difficult to visually adapt. Good news is Stafford does a valiant job with twisted images that carry this adaptation to the end. The Shadow Over Innsmouth, written by Leah Moore & John Reppion, illustrated by Leigh Gallagher: At first I didn’t like this one, but the more I reviewed it the more I enjoyed Gallagher’s classic comic book style and hollow white eyes. The Rats in the Walls, written by Dan Lockwood, illustrated by David Hartman: Were Lockwood’s writing fails, Hartman’s creepy/gory Disney-like illustrations did this tale justice. Dagon, written by Dan Lockwood, illustrated by Alice Duke: Lockwood finally shines in this anthologies final adaptation. Accompanied by Duke’s lovely imagery, Lockwood triumphantly wraps up with one of Lovecraft’s most original stories. Overall the artists are what make this book what is. Though I wasn’t fully impressed with all of Dan Lockwood’s adaptations, he still effectively edited an amazing looking graphic anthology. It is truly good to see how others view Lovecraft’s work, and fun to see how untraditional some folk’s visions are, I like that. I have already begun going through Volume 2, and am pretty impressed so far. I hope Self Made Hero continues to pump these volumes out. I have read/looked over Volume 1 many times and still can’t get enough of it. If you have read The Lovecraft Anthology: Volume 1, let me know what you think. And if you like all the tasty bits we gibber about here, become a follower or submit to receive email updates with every new post! Before I brought Unspeakable Gibberer to its current home, I started it on BlogSpot.com and generated a post about a new wave of Lovecraftian fiction for children. I was reminded of this silly post by a recent email from Adam Bolton, co-author and artist behind “Where’s My Shoggoth”, due out this month. Kindly, he informed me of a competition he and fellow co-author Ian Thomas threw together to celebrate the “release/escape”, as he put it, of the book this June. For details on how to order/preorder check here. And don’t forget “Baby’s First Mythos ” as well! I is for INNSMOUTH, a hell of a town, Where the people wear gold, and are quite hard to drown. 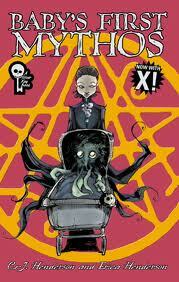 Learn your ABCs and 123s – Mythos style! 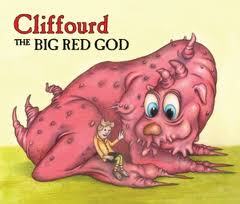 In the tradition of Gorey’s The Gashlycrumb Tinies, comes a children’s book based on H.P. Lovecraft’s writings. Blast your child’s soul as they learn their letters and numbers.Written by award-winning author, C.J. Henderson and drawn by Erica Henderson. Contains a forward by Robert M. Price and an afterword by Professor William Jones. I like the idea of starting these kids off young with Lovecraft. I believe it is very important to introduce them to imagination feeding text, and art to get them going. Keep your eyes peeled for books like these. The children’s market has been a rising interest for some authors, and they are taking a swing at creating their own “Where The Wild Things Are”. Below are some links to the other books mentioned.